It has been an exceptionally cold and snowy January and there is something about these winter days that makes me want to be in the kitchen baking bread. I have fond memories of my mom making homemade wheat bread on snowy days when I was growing up. It was wonderful to come into the house after playing in the snow to find two or three warm loaves waiting for us. I often make my mom’s recipe, but for the past year I have tried to incorporate nine grain mix into wheat bread, with many failed attempts. It is tricky to balance the moisture content in the loaf so that you have a chewy, nutty flavored but moist bread. It took some time, but I finally have developed a nine grain whole wheat batter bread that I am happy with. One advantage of this bread is that it does not require kneading; you just mix everything with a spoon (or in a mixer). It is very wet, much more like a heavy quick bread batter. Our family of four consumes three loaves in less than twenty-four hours: two hot from the oven, and the last for breakfast the next morning! In a bowl combine nine grain mix with 1 cup boiling water and let sit 15 minutes to soften. While the nine grain mix is softening combine the yeast, sugar and warm water in a large mixing bowl. Cover with plastic and let sit 10 minutes to start foaming. To the foamy yeast mixture add oil, honey and salt. Mix well, then add the nine grain mix and any of the liquid. Stir to mix. Add wheat flour, 1 cup at a time, mixing well. Add 1 cup of white flour and mix thoroughly. Add the remaining flour and mix to incorporate all the flour. It will be a thick and wet batter. Cover the bowl tightly with plastic wrap and let sit in a warm place for 1 hour until the batter has almost doubled. 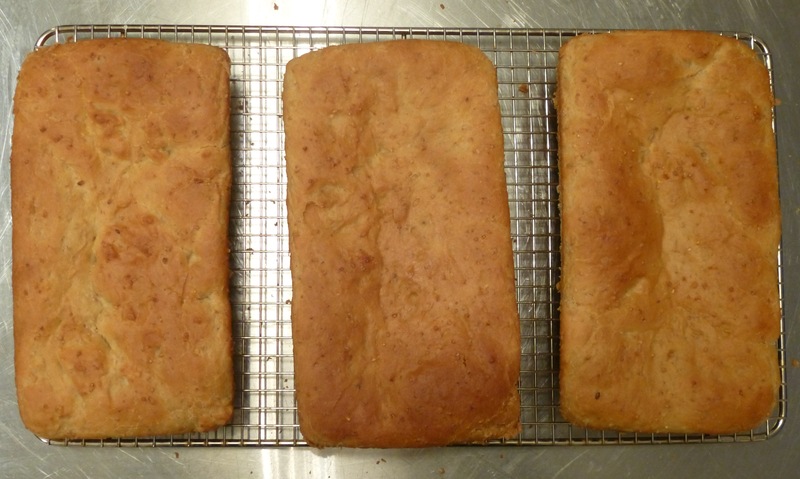 Grease 3 (9×5) loaf pans and pour batter evenly into them. Cover with a tea towel and let the batter continue to rise for 45 minutes or until the batter fills the loaf pans 3/4ths full. Bake at 350 degrees for 30-35 minutes until top of loaves are golden brown and an inserted toothpick comes out clean. Let bread sit in pans on a rack for 10 minutes, loosen the bread with a knife, and invert pans gently to remove loaves. We like to eat it warm with butter and jam. Makes 3 loaves. This entry was posted in Breads, Breakfast, Dairy-free, Grains. Bookmark the permalink.